Whether it is a price docket or introducing new technology, Xiaomi has always impressed its users with prodigious offerings. A couple of days back, we saw a launch of Redmi Note 7 in China for just 999 Yuan (10,000 INR). With such low budget, the device offers a range of new features including the much-talked 48MP rear camera and Qualcomm Snapdragon 660 chipset. And now, the brand is all set to bring the premium recurrence of the Note 7, the Redmi Note 7 Pro. The Note 7 Pro is likely to be launched on Chinese New Year that falls in the upcoming month. As of now, there are no announcements or details about the coming of these two Xiaomi smartphones in India, however, we may accept the launch in the Indian market very soon. Talking about the features and specifications, more or less, both the devices come with similar features with minor changes. For instance, the Redmi Note 7 came with a 48-megapixel Samsung ISOCELL GM1 sensor and now Redmi Note 7 Pro will have a 48-megapixel Sony IMX586 primary sensor which can deliver better image and video quality. With this, let’s have a look how these two Xiaomi smartphones are different from each other in terms of features, specifications, and prices. 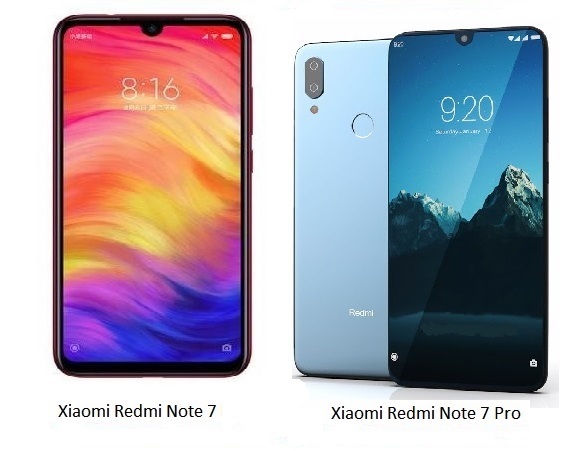 The Xiaomi Redmi Note 7 has launched in China and Redmi Note 7 Pro is likely to be launched by next month. In India, both the devices are expected to be launched soon, but there is no official confirmation from Xiaomi India yet. Looking at the price range in China, the two upcoming mobile phones are expected to be available in India at the price tag of 10,500 and 15,000 respectively. There are also rumors that Note 7 may cost less than Redmi Note 6 Pro which was launched last month in India, at the starting price value of 13,999 INR.